Despite it being 1992, a time when most thrash bands were falling over themselves to change their sounds to reflect the changing musical template of the new decade, German speedsters Rage took no notice and for their sixth full-length released something that stylistically fit right in the eighties. Like most of their catalogue, it’s pretty excellent, instantly a fun listen being a perfect balance of catchiness and the classic metal crunch which was so missing from the more famous names around that time. As those who will have followed the band this far will know, however, Rage are never content unless they’re walking their own path, and Trapped! therefore is as Rage-ful as fans of the band will have come to expect, complete with a very thin layer of experimental icing on the solid metal cake, never overwhelming the main experience but always enhancing it. Take opener Shame On You as a good example, beginning with the sounds of an Eastern market and acoustic strums, vocalist Peter Wagner voice mixing as well with that as the ensuing heavy metal crunch of Manni Schmidt’s guitar. It’s that guitar which drives the album, pumping out as many great riffs as Wagner provides vocal hooks, capably backed up by Chris Efthimiadis’ drum battering. Solitary Man is one good summary of how it all comes together, although Enough Is Enough proves yet again the band’s ability to take a simple, familiar melody and make a killer song out of it in perfect post-Helloween style. That would be as well as making it just under seven minutes long with some brilliant soloing! Really, picking killer tracks here is far too easy. 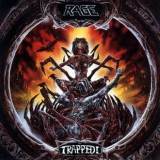 Different yet uniform in Rage-ing style, with enough variety to keep your ears trained and never a lack of catchiness, Trapped! is the band at their most enjoyable, and most solid in songwriting terms. Whether you’re listening to the old-school stomp of Take Me To The Water with its queasily fast vocals or the more speed-metally Medicine, Rage keep your attention tightly focused. Even when the keyboards come in on Baby I’m Your Nightmare, there’s no lessening of quality, and Accept cover Fast As A Shark is so good that it threatens to destabilise the album, mixing speed metal assault with singalong chorus so perfectly that it acts as a perfect summary of what Rage are all about. This album would actually serve as a perfect introduction to Rage, if you’re new to the German metal machine – in any case more than recommended if you haven’t heard it.